Movement: Culture is the first in a series of thematic representations of prints at David Krut Projects Cape Town (DKCT) that have been produced at the David Krut Workshop (DKW) since its inception in Johannesburg in 1999. This exhibition articulates themes around the movement of people, specifically within the South African narrative, as a microcosm of the large-scale movement of people in the 21st Century. The exhibition showcases prints by two accomplished and well-known artists whose works are largely based on the migration of culture, and its effect thereof, from the rural landscape to the urban environment, and back again. Both artists explore notions of migration and cultural movement in their works, albeit in alternating approaches. After growing up and living in the city of Johannesburg, Colbert Mashile relocated to Bushbuckridge where he set up a new studio and home. In this selection of work Mashile evocatively depicts processions where figures embark on a cultural and spiritually significant journey within a rural landscape. The figures are depicted as hybrid creatures, in human form with bull horns and mask-like faces. 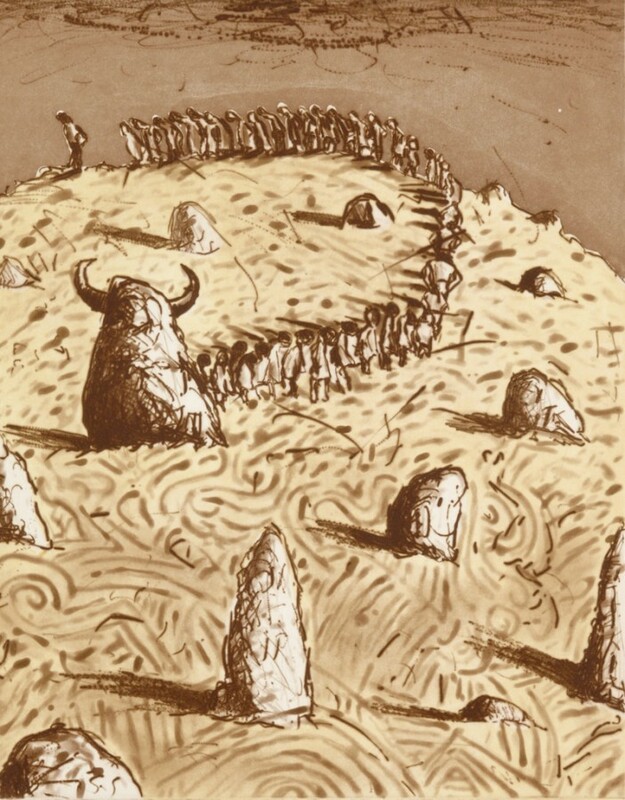 The artist’s prints speak to a ritual movement that is unspecified and unordered. In opposition to this sequence of movement, Senzo Shabangu left his hometown of Driefontein in Mpumalanga and moved to Johannesburg. The artist’s oeuvre of subject matter and mark-making evoke many eclectic readings into the thematic of movement: boxes falling from the sky, women and men travelling while carrying a multitude of babies on their backs, disjointed city skyscrapers taking off into a range of cubistic tangents as a way for the artist of dealing with the cultural change and challenges provoked by migration and migrant labourers. DK Archives – Movement: Culture seeks to explore the local and global currents of ‘people on the move’ through this selection of prints, evoking the viewer to reflect on the notion of movement within a cultural context.